Ca 1860, pear and chestnut wood, yellow brass, Kyung Ki Do Province. 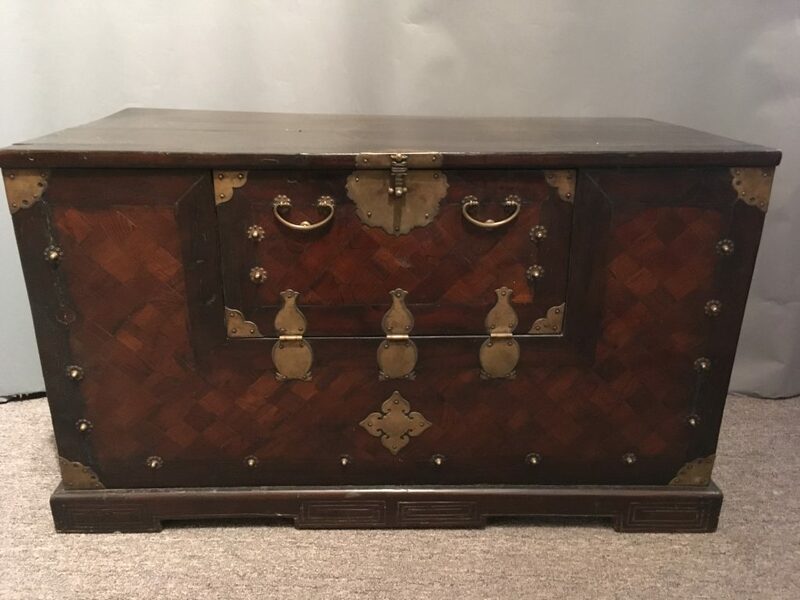 39″ w,19.5″ d, 23.25″ h.
This chest has a beautiful woven-cane pattern front made from pear and chestnut woods. It is certified as a blanket chest (bandaji) but it does not have the “half closing” door usually characterized by a bandaji. The door of this chest is small and does not extend all the way across the front. It is more what in Korea called a “chang”, a type of structure with a small door in the center opening downward with two door pulls. It is highly decorated with yellow brass, usually befitting a piece in a woman’s quarter, but with square corners, it was meant for a scholar or high official to store documents, reading material, scrolls and writing, or ritual objects in a man’s quarter. A chest made with this woven-cane design is labor-intensive and with beautiful brass work decorating it, it was made for a elite-class scholar or high official.